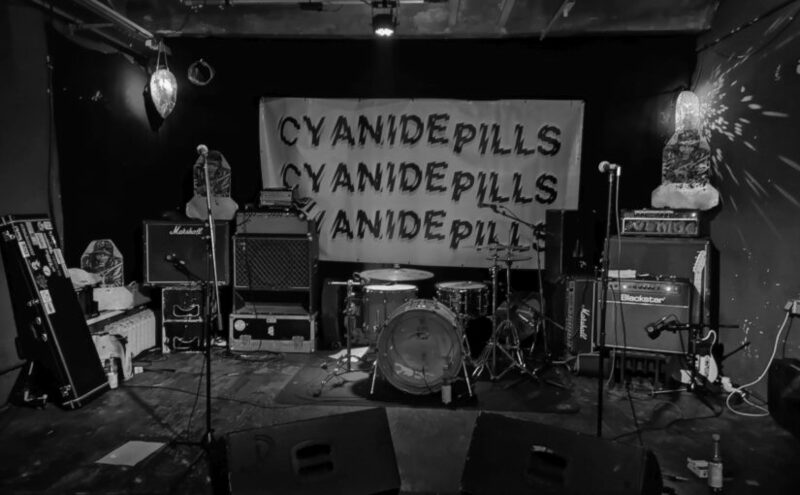 … a neat entry into a joyfull power pop weekend: Litterbug and Cyanide Pills upstairs! A rainy Thursday evening is actually the least best day for a crowded show, specifically if there is other entertainment in town too. Crowds where either drawn to the Fabrik (to see MC50 and Wayne Kramer) or to the MS Hedi (to see Nothington) … or upstairs to the Hafenklang in order to get ears ready for more serious power pop with the Undertones on Friday. Me and many friends decided for the Hafenklang and whilst initially it felt empty it later was decently filled (though not sold out). First on Jitterbug from sunny Blackpool (that seaside town up north that is subject to the annual pilgrimage by many of the Hamburg lot). Jitterbug play fast paced punk with some great bass play (and an almost hyperactive bass player) and less great singing. One of me mates noted „the guy on guitar seems to have too much on his plate when he also sings“ but for me it was still on the ok side. Would i go the extra mile for them? Nope. Did i appreciate their set? Yes indeed, at times their sound had some great speed variations and – as said – some great bass lines. In most of the songs actually the bass did carry the melody, something that only few bands make their unique selling proposition. … one of the greatest T-Shirts recently! 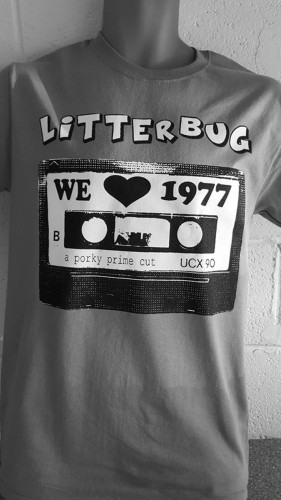 #1 Love for 1977, #2 A Tape and – with all tongue in check needed – #3 A Porky Prime Cut (and those who can not relate to that never ever called records from the hey days of Punk in the UK their own). Well done mates, well done! Ladies and Gentlemen I give you the band…. Just perfect: High energy power pop, scent of glam and and undertone of punk. And 5 different stage personas with unique schemes, grins and … sound. I felt victim to them a long time ago and i am always stunned that they are able to re-surprise me. In principle i know what will happen but when it happens i am still stunned. They blasted song after song, had fun on stage and fun off stage and made a lot of people in the audience smile (and some even to dance). To many outsiders they may look like a degenerated lot but in fact they are there to remind people that music is relevant for quite some time (when repacked every once in a while). Conquered! Though forever i will put forward the request that actually they do play my loveliest song! Please! When the lot dissolved after the show it was a lot of „see you tomorrow at Undertones“ and that is exactly what i will do. Just to get more of those 2:00 long power pop pearls! Format KurzmitteilungVeröffentlicht am 2018/11/30 2018/11/30 Kategorien ShowsSchlagwörter Cyanide Pills, Hafenklang, LitterbugSchreibe einen Kommentar zu … a neat entry into a joyfull power pop weekend: Litterbug and Cyanide Pills upstairs!